Ambient food? For those of you new to the Quattro Foods blog, or even for our regular readers, here’s a recap of the what, why and how of ambient foods. What? These are food products with longer shelf lives that can be used as part of menu plans or other foods. Why? They are designed to help save busy chefs time in commercial kitchens and to help food last longer. How? Using time-honoured kitchen traditions, our chefs are experts in sourcing ingredients that last and help preserve the other elements of the product. And in case you were wondering, they never, ever compromise on taste. What do all professional chefs wish for? Sharper knives? Smarter kitchen staff? Probably, unanimously, more time. That wasn’t a guess. We know it’s true as our customers tell us so, frequently. It’s a tough call. You are a seasoned professional chef and you pride yourself on making every element of your menu by hand, by yourself. However if someone else can make your tomato sauce or garlic paste, and it tastes just as good, is that really cheating? We don’t think so. As one of the UK’s leading ambient food suppliers we pride ourselves on making everything ourselves, but we most certainly do not look down on chefs who are forced to take a few shortcuts. That’s what we’re here for. I suppose we like to think of ourselves as off-site sous chefs. And why not? Why not save time and manpower on the more time-consuming aspects of cooking, to free yourself up for the more creative requirements of your culinary masterpieces? Our chefs love helping you out, your customers and diners will know no different, and you will save masses of time in the kitchen. Win, win! Sadly, money is always an object. But in the case of ambient foods higher cost doesn’t mean higher quality. In fact, quite the opposite is true. Our ambient range is the embodiment of incredible value for money with quality always a top priority for our exacting kitchen team. You will never pay over the odds for the highest quality ambient foods with Quattro. It’s simple. It has to taste fantastic, otherwise there’s no point in anything we do. If your customers are not happy, we are not happy. We ensure that no one will ever know that you – top chef – are not solely responsible for every single flavour in the food. Our chefs’ top priority is flavour, which they achieve by using the freshest locally sourced ingredients. There’s nothing we value more at Quattro than a happy customer. You say jump, we ask ‘how high?’ Nothing is too much for us or too inconvenient for our friendly, skilled, experienced and amenable staff. Pick up the phone for a natter – and you’ll find out how personable we are! We go all out for the comfort of our fellow chefs. All this chopping, peeling and cutting getting in the way of your creativity? Let our chefs do the dirty work. They love it anyway. Never known to let anyone down, Team Quattro is committed to the utmost of dependability, cementing our most sincere and steady reputation. Reliably delicious, reliably fast, reliably great value and reliably convenient. We are certainly…well…reliable! We source only the freshest local ingredients. We use tried and tested traditional hand-cooking methods for the most authentic results and the deepest of flavours, and never a whisper of compromise on quality so much as slips into a corner of the Quattro kitchen. We believe that home style cooking processes create the best results and our passionate chefs prepare much of their food by hand. Quattro’s long-standing cooking methods are the antithesis of modern mass production. Choices, choices…. 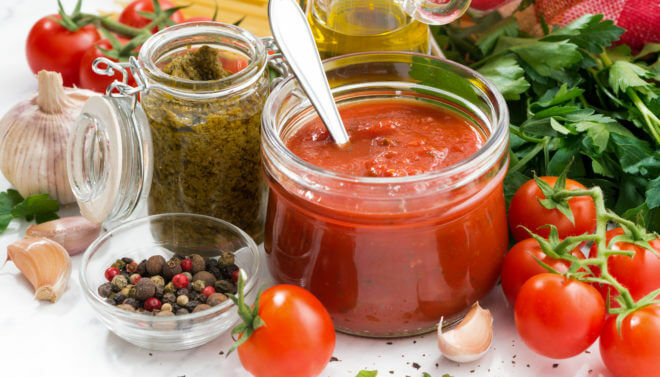 Pasta sauces, curry pastes, salad dressings, soups, pie fillings and more. Our range is so extensive even we can’t remember what’s on the menu without writing it down! Covering ethnic food, vibrant colours, interesting textures and a variety of diverse flavours from around the world, our vast range of ambient foods is mind-boggling. We can supply in various quantities. Orders big and small, we love them all. We cater for bulk orders or smaller orders to suit the differing needs of our varied clients including high street retail outlets, the NHS, food service providers, schools and the army, who buy in bulk. Independent restaurants usually order smaller quantities with more frequency, but either way we can cater for you. We wouldn’t want to give anything away by offering a nice round number (ending in 0 and starting with 6) to indicate the combined years of experience of our incredible team of development chefs. There are only 2 of them so do the maths….Our customers know that only the best will do, which is why we only employ the best (Tony added that bit). In short, our ever-popular ambient range is designed for chefs who are committed to great taste but cannot spare the hours and people required to peel, chop, stew or slow-cook. We have that time and that capability. We give each ambient product the hours necessary to ensure a truly deep flavour, so come to us and let us help you be the best.